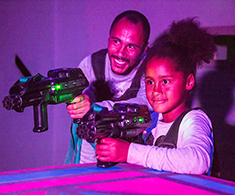 The minimum number to book a party is 8 players and the max capacity in the game zone at one time is 12 players, however we can accommodate larger or smaller groups. Please contact us for more information. The party package also includes FREE Star Command themed invitations! Wet the appetite of your friends with these cosmic style invites, we’re sure they’ll all be replying YES! To make a booking enquiry, please select your preferred date and time and fill out the relevant details on the next page. Our helpful Bookings Team will then be in touch within the next 24 hours to confirm your party. PLEASE NOTE: All parties must be booked and confirmed at least 1 week before the date. If you are looking to book within the next 7 days, please contact our offices directly on 033 033 38085 for availability.